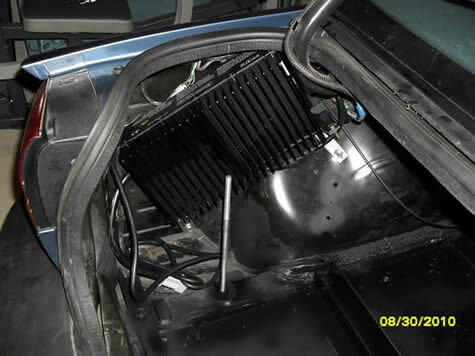 The plan initially was to create a "basket" out of angle iron which would hold the batteries in the area where the spare tire used to be. 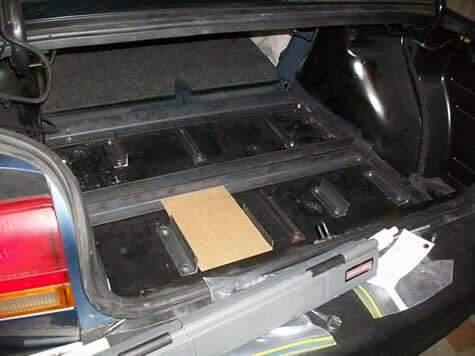 This would have lowered the car's center of gravity and increased trunk space. So, I started by cutting out the spare tire well. It cut out pretty easily with an air cutter and grinder. Shortly after cutting this out, I ordered my batteries. I ended up buying a different type than I originally planned for, and the new batteries were larger in size. There was no way 8 batteries were going to fit in that hole. Woops. So, I decided to cover the hole and act like nothing happened. The mistake won't matter much because it wasn't structural (the cut didn't touch the frame). I used an old street sign to patch the hole. 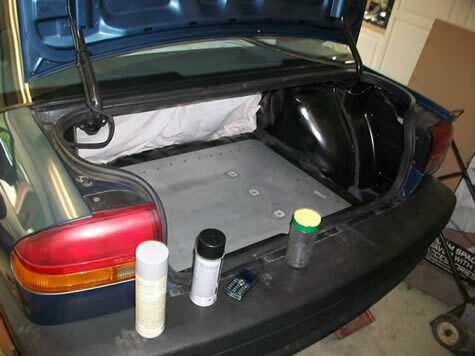 I painted the exposed metal in the trunk and began screwing the sign into the trunk using self-tapping sheetmetal screws. You'll notice I have a sheet covering the backs of my seats-- this was to protect them from the spraypaint. It actually looked pretty cool with the screwheads exposed, but I ended up painting the sign black to match the trunk color. 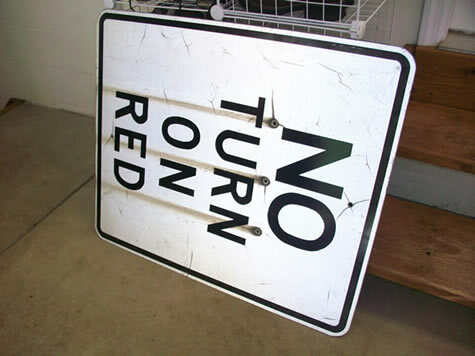 Ultimately, the sign wouldn't be holding the weight because the angle iron would eventually distribute the weight. More on that in a moment. 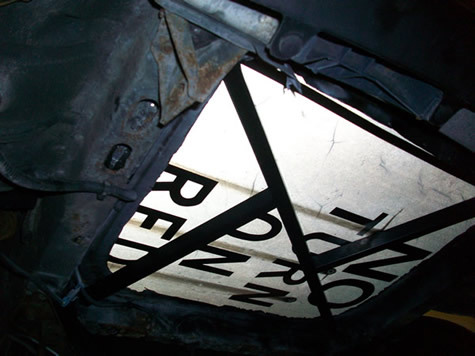 Here's the underside of the trunk, I actually like how the sign is still visible. I installed steel bars going across the sign because i was worried about sagging, but it really doesn't even need it. 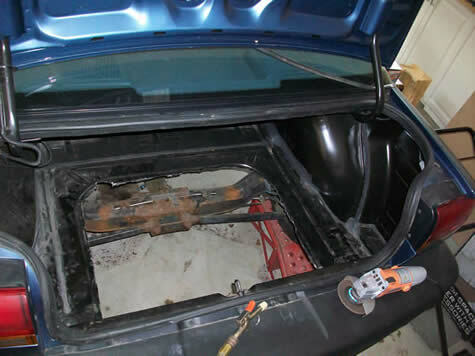 I cut and installed angle iron in the trunk to hold the batteries. The weight would be distributed using this method. I also used small pieces of angle iron to create divisions to hold the batteries in their own "cells". 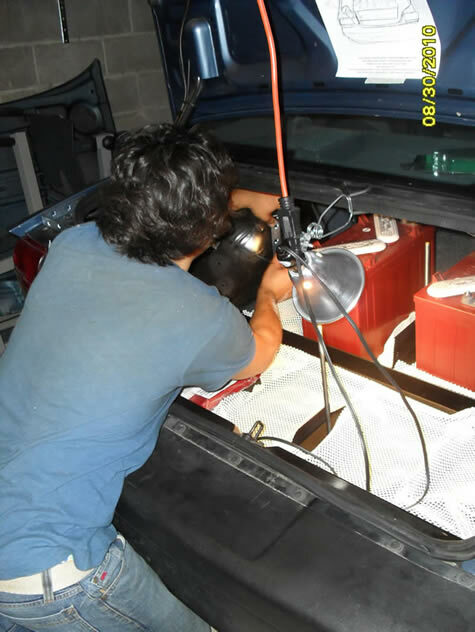 Everything was secured down using sheetmetal screws. 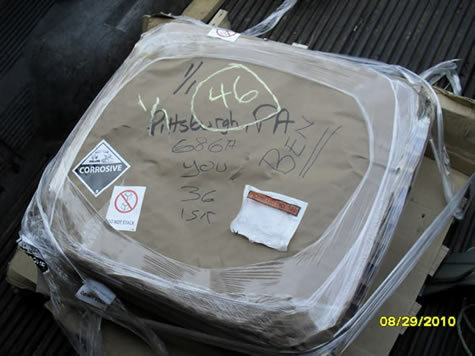 The cardboard in the picture was a template for sizing the cells based on the battery size. 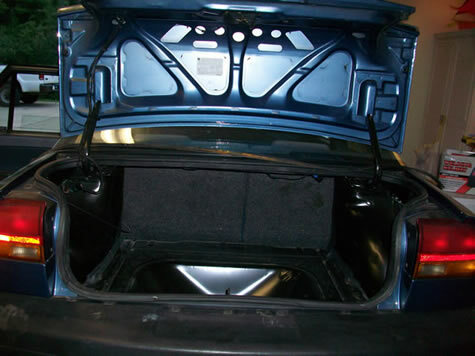 I installed the charger in the trunk, on the driver's side so that the cord could easily be fed out through the fuel cap. It's an Elcon PFC-1500, and these things tend to get hot. It can't be mounted vertically because it wouldn't be able to dissipate heat as well. Since it can't sit horizontally due to space limitations, I installed it at a strange angle using L-brackets. 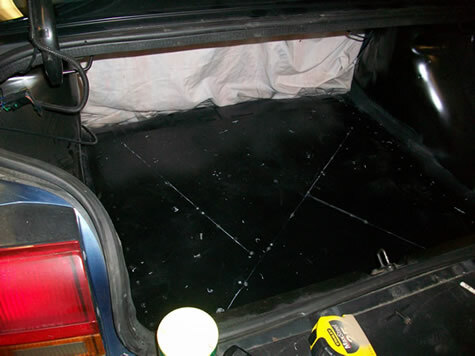 I lined the trunk with rubber pieces, meant for use under rugs. This will resist movement and vibration of the batteries. 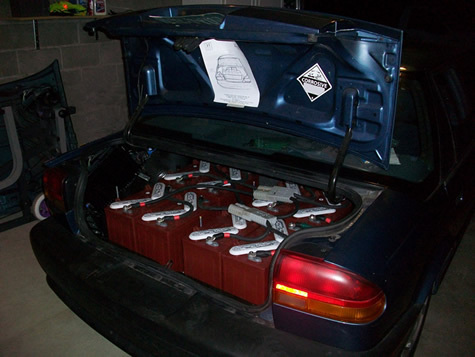 The batteries were installed one-by-one. They are about 80lbs each. 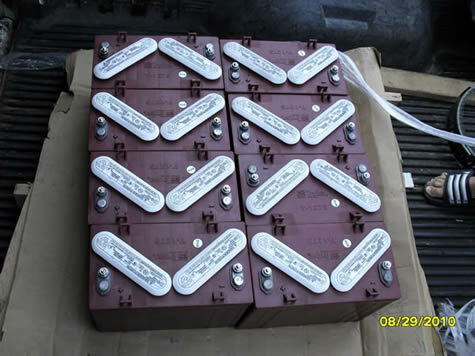 The high-voltage wiring was finished, putting the batteries in series. There are several plastic "Anderson disconnects" which are just big plugs which allow you to disconnect the wires from eachother. I have them set up so that when all the disconnects are disconnected, the batteries are in four groups of 24volts each. This way I can work on the batteries without fearing for my life.